The Northern Ireland Mixed Marriage Association (NIMMA) was founded in 1974 as a result of a conference held at Corrymeela.We provide country-wide support and information to couples either in or contemplating mixed marriage. In a society where sectarianism is institutionalised, NIMMA continues to lobby for the acceptance of mixed marriage, increased integrated education and wider availability of shared social housing. Much has changed since those early days and NIMMA has played a major role in influencing landmark changes in attitudes and regulations toward mixed marriage. NIMMA strives for further changes to baptismal restrictions imposed by all the major denominations, for eucharistic sharing for interchurch couples, true reconciliation and a shared future for all. You can download a short 5 minute video on the purpose and activities of NIMMA which explains why mixed marriage is still an important issue for Northern Ireland. Many people have, through NIMMA, shared their experiences of being in a mixed marriage and on growing up as children of a mixed marriage. We will be publishing a further edition of stories focussed on people in mixed relationships who have left Northern Ireland.If you have a story to share please contact our office. It is your story and will not be published unless you are content to share with others. NIMMA have published "Both Sides Now" a sequel to "Mixed Emotions" where children within mixed marriages tell their own story. Launched by Professor Pete Shirlow, as Deputy Director of the Institute for Conflict Transformation and Social Justice at Queens University, Belfast, in his forward, Professor Shirlow notes "These individual stories, real life experiences in the words of the people themselves, speak of hope and courage, compromise and determination. They tell of good times and bad, of love and prejudice, of diference and division, but they also speak of family as a force for good, often against all the odds." 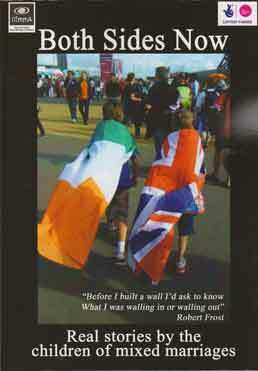 The book is available from NIMMA and was funded through the Big Lottery Fund. Our Newsletter introduces all those featured in the book. Both Sides Now has been distributed to over 400 schools across Northern Ireland and is being used as a poignant education tool. NIMMA is pleased to have worked in partnership with the Northern Ireland Council for Integrated Education to develop a play based on the NIMMA Mixed Emotions publication. This is a valuable teaching resource aimed primarily for young people. A video of the play, and accompanying discussion, can be viewed on You Tube by searching on "Mixed Emotions Play Belfast" or use this link. March 2016 news highlights NIMMA's expansion into online funding donations and gives an update on progress towards Charity Commission registration. An interesting feature tells of a monument to a mixed marriage in the Netherlands connecting Protestant and Catholic sections of a cemetry. Dealing with the Past: NIMMA’s recording of the history of mixed marriage in personal examples has earned it membership of The Stories Network (TSN). This is an organisation, set up under the auspices of the reconciliation charity Healing Through Remembering, that aims to fill the void about dealing with the past. TSN has produced a policy document about dealing with the past, with NIMMA as a consultant contributor, that has been distributed to local politicians detailing the expertise and experience of the group membership in this field and how it is best placed to tackle one of the peace agreement’s most contentious issues. NIMMA are currently seeking funding for a third publication to follow Mixed Emotions and Both Sides Now. It is now time to hear the voices of those who left Northern Ireland due to being in a mixed relationship. NIMMA welcomes contact from such couples and are actively engaged in making the arrangements for this exciting project. Keep up to datge with progress and further news stories are available through our Newsletters. Both Sides Now documents the lives and stories of children raised within a mixed marriage. They reflect on their childhood experience within a mixed marriange and in their own words provide commentary on their personal experience. All love stories are unique and the ten accounts of mixed marriage told in the latest NIMMA publication "Mixed emotions" are no exception. Couples share their collective experience, stretching over seven decades. You learn how society has changed and yet how it remains the same. Their reveal how relationships can be made to blossomin face of opposition and we learn how to aspire and achieve far beyond our common divisions. A report published by the Northern Ireland Mixed Marriage Association (NIMMA) stresses that, despite more than one in ten marriages now being mixed, there is still much to do to create greater awareness and acceptance of interchurch marriage. The academic study of the work and impact of NIMMA represents the most recent in-depth look at the area of mixed marriage, with all of its connotations for church practice, education, housing and tolerance, to have been undertaken in Ireland. It is an accessible and valuable piece of social history which, while documenting the past, lays down guidelines for the future. Copies of the report are now available from NIMMA at Bryson House, Bedford Street, Belfast BT2 7FE or by e-mailing info@nimma.org.uk or telephoning Belfast 90 235444. Read more. Are you in a mixed relationship? Our publication "Mixed Marriage in Ireland" is a useful companion guide for those involved in or contemplating a mixed marriage. It provides practical advice on preparing for a mixed marriage and on raising children within a mixed marriage. It provides useful information which clarifies an often confusing situation and helps couples decide what is best for them. You can obtain a copy by contacting us. A small charge is requested to cover costs. Further publications available from NIMMA include "Mixed Emotions", the stories from a range of couples in mixed marriages told in their own words and "Both Sides Now" covering the experiences of children of mixed marriages. "Evaluating the Impact" presents research into the impact of NIMMA on couples, on churches and on society in Northern Ireland over the years, tracking the changes in society over the decades since NIMMA was first formed. NIMMA is a registered charity and depends on membership, on our volunteers and on grants. Our main funding is through the Esmée Fairbairn Foundation with match funding through the Reconciliation Fund of the Department of Foreign Affairs, Cadbury Trusts and Big Lottery for specific projects. Suprisingly our main source of funding from within Northern Ireland remains donations from the public. We depend upon grant aid for specific projects, conferences, publications and research. Taking forward our development projects will depend upon obtaining funding and support. We would welcome your help.You can donate online.